The phrase "let's roll" takes on a whole new meaning when you're perched aboard a Segway. Yesterday and today, I'm playing tourist in my own town as a guest of the White River State Park Development Commission. 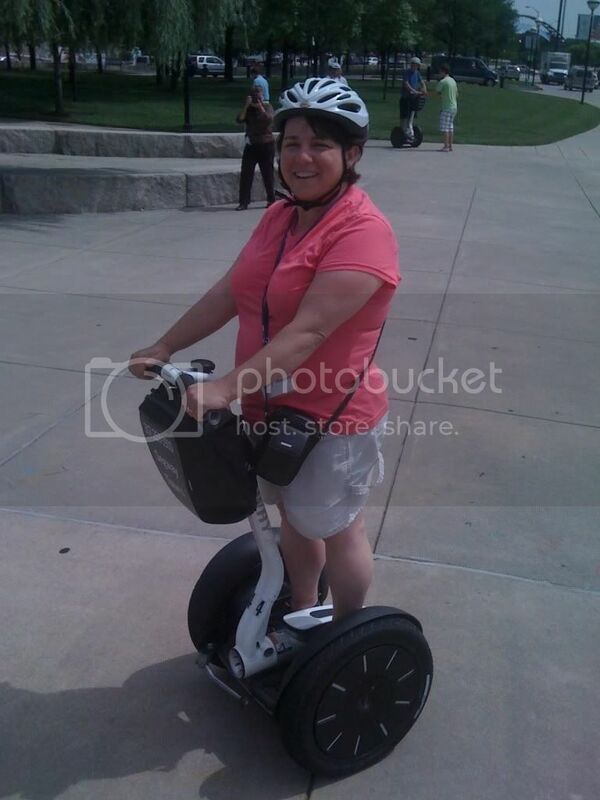 One of yesterday's highlights was the Segway ride around White River State Park in Indianapolis. I'll 'fess up to being a little nervous. I don't have a terrific track record when it comes to mechanical things you have to stand on. There was the treadmill at my sister's gym when I was in college. I got a little bored with watching the television in front of me. Behind the treadmills were some great windows that looked out onto the street. So I decided to turn around and look out the windows, walking against the movement of the machine's belt. It took about 3.2 seconds for the treadmill to throw me off into a heap on the floor. I think my sister was mortified -- although she was laughing so hard that it was hard to immediately sense her embarrassment. Then there was the Nordic Track in my parents' basement. I'd seen the infommercial on TV. It looked pretty easy, so I decided to give it a try. About 7.4 seconds after I climbed on, my feet slid all the way forward, my arms stretched out completely in front of me, and I was stuck (imagine a boomerang shape). I couldn't stand up and if I let go with my arms, I would fall on my arse. So I did the only thing I could -- started hollering like a mad woman for someone to come rescue me. Fortunately, Mike heard me and came to help, after he stood there for what seemed like way too long laughing at my predicament. Mike offered a prediction that I would be the one to fall off, crash or in some other way embarrass myself (or him). I wasn't too sure that he was wrong. Surprisingly, the Segway was easy to get the hang of. After the Segway master (I wonder if they've ever been called that before?) turns it on, you grab the handlebar with one hand, step up with the same foot, then grab the handle with the other hand and step up with the other foot. Moving forward is as easy as shifting your weight forward to the balls of your feet. Going in reverse happens by shifting back onto your heels. It didn't take too long to figure it out, although I kept picturing myself as one of those large and lazy people hovering around on the spaceship in the movie Wall-E. The tour was awesome! 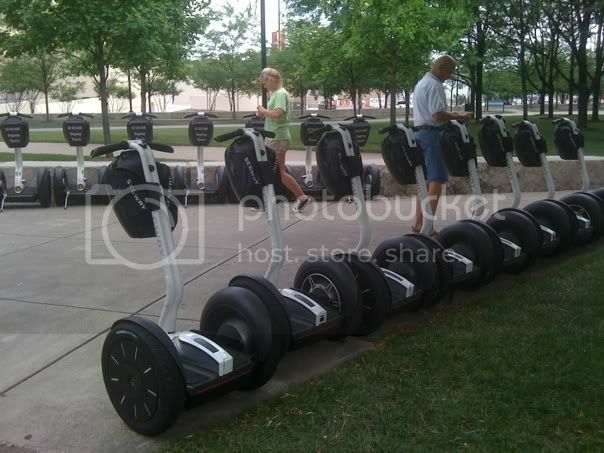 We Segwayed for probably 90 minutes, going all over White River State Park and along the beautiful canal. I was a little nervous going on the sidewalk over a bridge where lots of traffic was driving. One false move and my Seg and I would have been a mangle of flesh and metal. But not to worry, we made it over the bridge without incident. Two people in our group did have a little trouble. The first lost control of his Segway on the other side of the bridge and it whipped around with a mind of its own for a second or two. The second fell off while we were stopped at the top of a hill. Fortunately, she was ok, and so was the Segway, even though it tumbled down the hill and ran into a tree. Riding the Segway was tiring to my feet and back, something that our guide White River State Park Director Bob Witt said is less common as you get used to riding and more relaxed. I definitely want to try it again sometime. And at $45, while it's not something I'd do weekly, it's absolutely affordable for the occasional date night, out of town visitor or other occasion. Once I get back home, I'll have more pictures and some video to share. I don't have the right cord to connect my camera to the computer. I would have taken more with my phone, but we were warned to not text and Seg. I woulda totally crashed & burned, I'm sure! You did great and never showed your fear of technology. How fun-- I've always wanted to try one of the tours! Cute picture! How fun! I've always wanted to try that!